Vegetarian or even meat-based veggie bowls are a great and wholesome meal idea for any meal of the day. They can easily be adapted to your tastes and to the seasons. 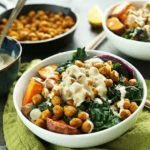 Here is one recipe I really like for a vegetarian, nutritious and healthy breakfast/lunch bowl that is packed with Spring seasonal goodness! Enjoy! Mix all ingredients together – it is often easier to dilute the tahini in the lemon juice first, then add the oil and finally dilute with a little warm water until the consistency is fluid but still rich. Add sesame seeds at the end. Mix all ingredients together – it is often easier to dilute the miso in the lemon juice first, then add the oil and garlic. For the chickpeas, warm oil with spices and garlic in a pan or wok. When garlic has become slightly tender (but not brown) add the chickpeas and sauté until they become golden brown. Add salt and pepper and set aside. Put sweet potatoes and cauliflower in a baking tray and toss them with olive oil and salt. Bake about 35+ minutes at medium-high temperature until soft inside and starting to lightly brown on the outside. Toss and turn them every 5-10 minutes to ensure all sides are cooked. Set aside. Lightly sauté sprouting broccoli or spring greens in a wok or pan with some olive, avocado or coconut oil and a clove of garlic crushed and roughly chopped. The greens should be cooked but still slightly crunchy. Add salt, pepper to taste and set aside. Make the tahini or miso sauce as preferred. In a large bowl, put grains first, then around the grains add the sweet potatoes, chickpeas, cauliflower and greens. Add the sprouts, avocado and herbs on top and coat everything with the sauce of choice. If you are making this for work the night before, add the sauce just before eating. The bowl can be made with any vegetable and pulse combinations. If you don’t want to include grains they may also be excluded. The main vegetable protein element (chickpeas) can be replaced with a soft boiled or poached egg.